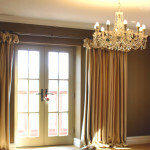 A professional curtain maker in Standish is the perfect way to up the appearance of your room. Dressing windows should be taken as seriously as choosing your flooring system or the fabric to use on your couches. Curtains, when chosen correctly, make a room. Certain factors need to be taken into account when settling on what curtains to use, including colour, fabric, length and lining. Millan Interiors takes note of all of this so that we ensure your curtains bring harmony to your room. With a professional curtain maker, you have the choice of customising the dimensions of the curtains to the size of your window and have an endless array of designs to choose from, including the header style. This is not always the case with ready-made curtains. You run the risk of them not fitting or purchasing a generic design that will be found in many households. If you want to have your room make an impact in Standish, a professional curtain maker is definitely something to consider. Here at Millan Interiors, we are firmly established as fine curtain makers and upholstery designers. Our curtain makers use only the finest workroom products. They are award winning, so you can be sure this will reflect on the completed work. In order to ensure you get what you desire, we’ll carry out a home consultation so that we understand the space we’ll be working with. We’ll help you choose colour schemes and create mood boards so that we can visualise your desired outcome. Give your windows new life by using a professional curtain maker in Standish. Contact Millan Interiors for service worth your money. We have interior design services as well lead by our co-founder Debbie Peers and business partner Adele Headley. We endeavor to stay professional throughout the project from concept of idea to implementation and completion. We also have decorating services and can help your idea be realised by taking care of finishing touches such as lighting and furniture. Let us help you extend the creativity to every corner of the room as well.